Indonesia, February 18, 2014 – Cargill today announced that its oil palm plantation in West Kalimantan, PT Harapan Sawit Lestari, has received the Roundtable on Sustainable Palm Oil (RSPO) certification, covering all of PT Harapan Sawit Lestari’s operations – Manis Mata and Paku Juang mills, inti (company-owned) and KKPA (Koperasi Kredit Primer Anggota, cooperative credit scheme - smallholder) estates. This is Cargill’s second RSPO certification, after the first received by PT Hindoli in South Sumatra. PT Indo Sawit Kekal, Cargill’s other plantation in West Kalimantan, is in the process of being RSPO certified. The RSPO, a global, multi-stakeholder initiative on sustainable palm oil, brings together organizations such as environmental and social NGOs, growers, manufacturers and retailers of palm oil products. It aims to promote the growth and use of sustainable oil palm products through credible global standards and the engagement of these stakeholders. With the demand and use of palm oil expected to grow unabated in the years to come, it is important to ensure the sustainable and efficient management and production of palm oil, guaranteeing a consistent, and environmentally and socially sustainable supply. Over the last decade, the Indonesian palm oil industry has been a significant driver of the overall growth in palm oil production, producing over 31 million tons in the last year alone. 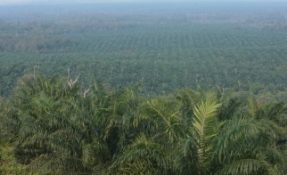 Pictured above: Cargill's West Kalimantan, PT Harapan Sawit Lestari palm plantation. The palm plantation is one of Cargill's three palm plantations located in Indonesia. Cargill currently owns and operates three palm plantations in Indonesia – PT Harapan Sawit Lestari and PT Indo Sawit Kekal in West Kalimantan, and PT Hindoli in South Sumatra. Cargill has had its own policies in place for responsible palm production on its plantations, even prior to the establishment of the RSPO principles. These include commitments to not plant on high conservation value areas, not develop new plantations on deep peat land or land that would threaten biodiversity, as well as a strict no-burn policy for land preparation. In August last year, PT Harapan Sawit Lestari was also awarded with the official certification for sustainable palm oil supply for biofuels, according to the International Sustainability and Carbon Certification (ISCC) standards within the European Union (EU). This certification also covers PT Harapan’s entire operations, including smallholder plantations managed by Cargill under the KKPA scheme, mill and warehousing operations. Cargill has been committed to responsible palm oil production in West Kalimantan since 2005, when it acquired PT Harapan Sawit Lestari. Since then, Cargill’s operations in West Kalimantan, consisting PT Harapan Sawit Lestari and PT Indo Sawit Kekal, have expanded to close to 32,000 hectares of responsible oil palm plantations. Having been a member of the RSPO since it was founded, Cargill is an active supporter of sustainable palm oil and hopes to encourage other producers to adopt more sustainable practices in view of the rising demand for sustainable palm oil amongst manufacturers and retailers. In addition, Cargill supports efforts to help farmers adopt sustainable agricultural practices, improve land use, increase the quality and quantity of their crops, and promote safe and efficient working practices.